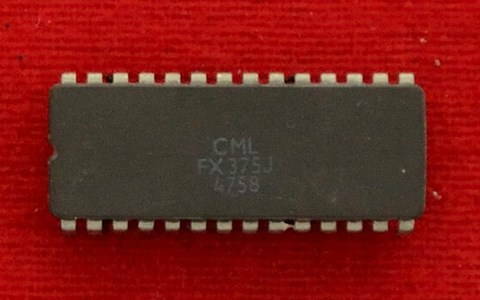 The FX375 is a Low-Power CMOS LSI microcircuit designed for Tone Operated Voice Privacy in communication systems. This half-duplex device consists of a Fixed Frequency Voice Band Inverter interfaced with a Continuous Tone Controlled Squelch System (CTCSS) Encoder/Decoder, whose allocated tone is used for voice privacy, and audio squelch operation. Frequency Inversion is achieved by modulating the input audio with a fixed carrier frequency to exchange the high and low frequencies of the voice band, making the resulting audio output unintelligible to receivers not equipped with a compatible system. The on-chip CTCSS is capable of encoding and decoding any one of 38 sub-audio tones in the range 67.0Hz to 250.3Hz, these Xtal derived tones are selected by a 6-bit binary word that can be loaded into the device in either a serial or parallel format. The Privacy function is exclusive only to units using the same tone set; other intercepted signals remain "as transmitted." A 'Press to Listen' facility allows monitoring of the channel before transmitting. This device has separate, switched Rx and TX voice, and tone audio paths. Voice paths use switched capacitor bandpass filters for the attenuation of sub- audio tones and unwanted modulation products. 6dB/octave pre- and de-emphasis filtering in the TX path maintains natural sounding audio from this device when embodied in communication transceivers. The FX375, which is available in DIL and SMT packages, can be simply controlled by switches or interfaced to a µProcessor. External requirements are a single 5-volt supply, an external 4.0MHz Xtal or clock input and signal coupling components.